Gong de Lin – Vegetarian and MSG Free! Gong de Lin is a newly opened all Vegetarian restaurant located in the heart of the Melbourne CBD. It is a bit hard to find as it is located at Level 3 and you need to enter another restaurant and take the lifts up to the restaurant itself. The restaurant itself has a green and white theme and I associate those colours with vegetables (green = veggies) and has individual wooden tables as well as booth style tables. We had a group of four and we were allocated to a booth which overlooked Swanston Street, so it was quite a nice view – watching people bustling around on the streets of Melbourne. The feel is quite bright and vibrant. 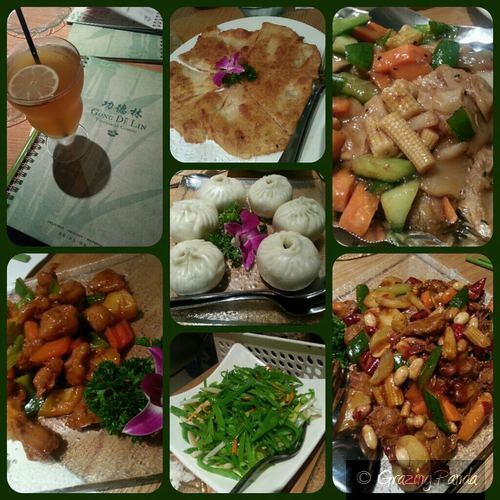 Gong de Lin is entirely vegetarian and the menu is extensive to say the least. There are pages and pages of different options that you are left bewildered and not sure in what you want to pick. The menu has icons which tell you the recommended dishes by the chef, as well as the level of spiciness of the dish. The menu which is entirely MSG FREE (which is a big WIN in my book) – is made of up of many mock meat and seafood dishes, as well as many mushroom and vegetable dishes. There are also some interestingly named dishes such as the Hedgehog Mushroom, the BBQ Boletus Edulis (which we were told is a type of mushroom), Mountain Mushroom. There are also some pictures of some of the dishes if you need some help deciding, otherwise the friendly waitresses are happy to make suggestions of what dishes you should try. There are smaller dishes and starters – such as dumplings, wontons and baos. The vegetarian pancake (which is similar to the spring onion pancake in most asian restaurants) is delicious and crispy. The dishes are decently sized and this place is great if you go with a bunch of friends and share a whole lot of dishes – this way you get to sample a bit of the menu. Mind you with the amount of variety you will need to come back here many a times before you get through the whole menu! The dishes are also plated up quite nicely as well – always with a purple lily on the side. Another plus is that the dishes are priced very reasonably. This place is a great addition to Melbourne and one of the first ALL vegetarian places that I have tried. The food not only looks great but tastes fantastic as well. There are so many interesting dishes on the menu such as Vegetarian Goose, BBQ Boletus Edulis and Vegetarian Sea Cucumber – just to name a few. This place is great for vegetarians who want to “try” meat without any fuss or for meat lovers as well. The food is pretty great. I will definitely be back to try out many of their intriguing dishes! 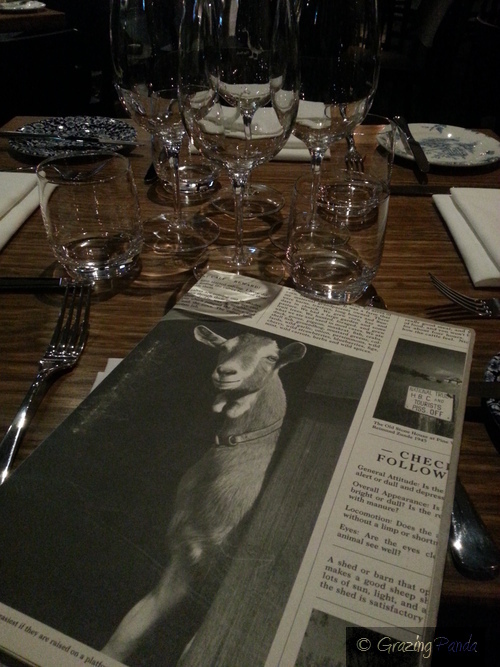 Atmosphere / Ambience: Comfortable and great for a catchup dinner with friends. Its better to go in a big group so you can all share multiple dishes. Service: Friendly and Helpful. As we were located in a booth in the corner, they didnt come around many times so it was hard to get our water glasses filled up or ask them for more rice – but this is just something minor. 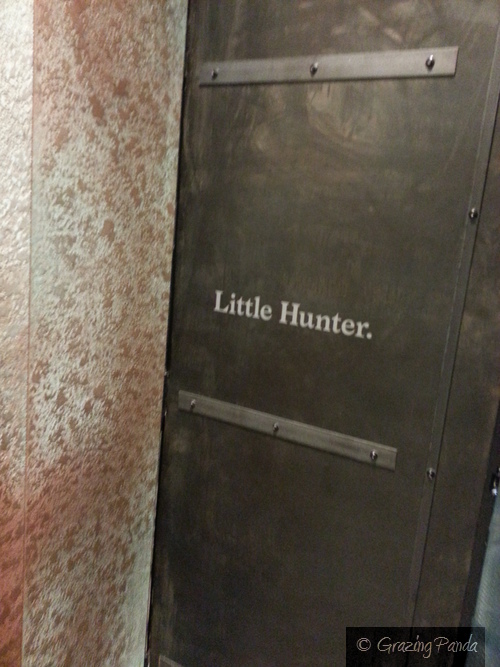 I had heard about a new place that had opened up in Melbourne called Little Hunter and headed there with A for dinner. Little Hunter’s team is a collaboration between American chef Gavin Baker (who comes from the world renowned Fat Duck) and Pete Evans – chef and host/judge on My Kitchen Rules (MKR). As the restaurant space is quite large, there are many different dining areas that consist of communal dining areas which range of tables sizes from 2 to more. There are also some private tables as well as a few cosy private booths. There is mood lighting and the place has just the right amount of light yet has a mysterious feel about the place. This brings me onto the menu – “which draws inspiration from the land, the farmer and the finest breeds in Australia.” Everything is done in house from the curing and smoking of the meats to sourcing great local produce and supporting artisans and farmers. The menu is split into 5 different sections – Small, Sides, Large, Steaks and Desserts. The waiter informs us that Little Hunter is known for its meat and steaks, however there are a few vegetarian friendly items on offer. Whilst we wait for our ordered food to arrive, we are given some house-made bread which resembles a mini loaf and have been cut into individual pull apart slices. The bread is nothing short of amazing!! The slices are soft and buttery, has herbs through the centre and encased with cheddar cheese. The best cheesy bread I have had. 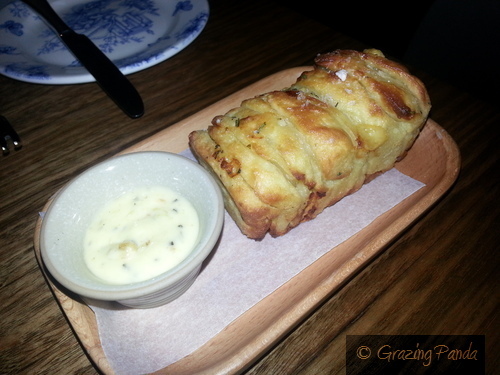 If this isn’t enough of the yuminess – the bread comes with a Chicken Fat and Chicken Skin Butter. I didn’t have any of the chicken skin butter, but A loved it and said the combination was fantastic. A definite winner! A ordered two entrees for her meal – Cured Kingfish – seasoned Roe, Roasted Peppers, Bay Oil and the Watermelon Salad – Land Cress, Goats Cheese, Dandelion. For my main I ordered the Chatham Blue Cod with Native Grasses, Leeks and Remoulade. 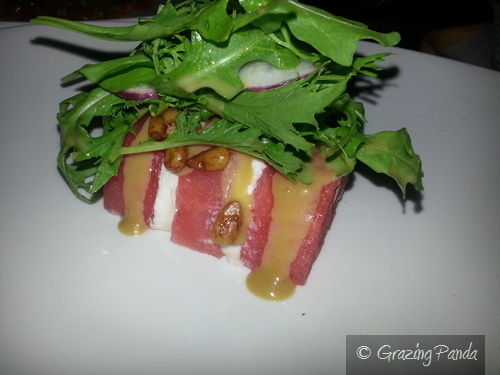 The Watermelon Salad comes out looking like a dessert log with watermelon slices sandwiched with goats’ cheese in the middle top with a handful of land cress and dandelion greens. You need to get a cross section of the whole log to experience all the flavours – the sweetness of the watermelon with the sourness of the cheese and the crispness of the greens. A refreshing dish. The Cured Kingfish was thin pieces of kingfish topped with roasted peppers on one half and salmon roe on the other half. 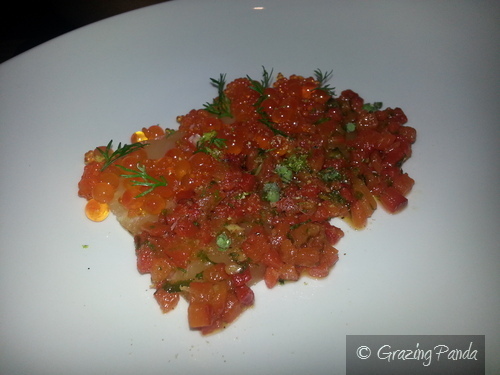 The spiciness of the roasted peppers together with the salmon roe worked perfectly with the flavorsome kingfish. My main dish was the Chatham Blue Cod and when it came out it was beautifully presented – the cod was centrally placed on the plate surrounded with little coils of braised leek and a cluster of small grapes with the native grasses. The Blue Cod fillet is grilled perfectly and has a golden brown colour on the outside and soft flesh on the inside. There is a rich brown butter sauce over the top and mixed with the woody native sea grasses (which is samphire) makes for a great tasting combination. 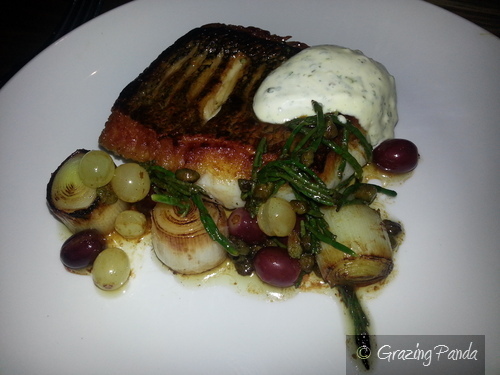 The addition of the braised leek and grapes add for flavours that complement the fish and the sea grasses. One of the best fish dishes I have had. For dessert I ordered the Frangipane Meringue with Passionfruit Curd and Whole Peach Sorbet. Once again this dish was beautifully plated up and the he Meringue and Passionfruit Curd came out reminiscent of a fried egg and the dish somewhat looked like a breakfast dish – bacon and eggs perhaps? 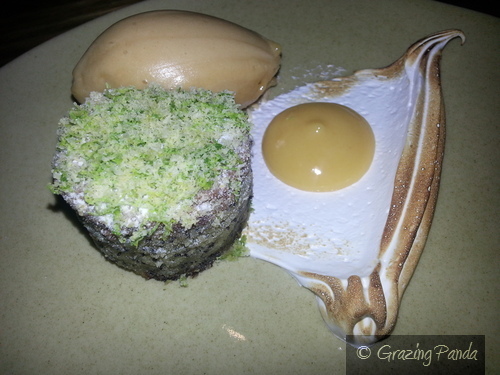 A Frangipane cake was dense and complete with poppyseed and lime zest, topped with coconut was situated next to the peach sorbet. The combination of the meringue, cake, passionfruit curd and sorbet was a party of flavours in your mouth and definitely a must try dessert for all. 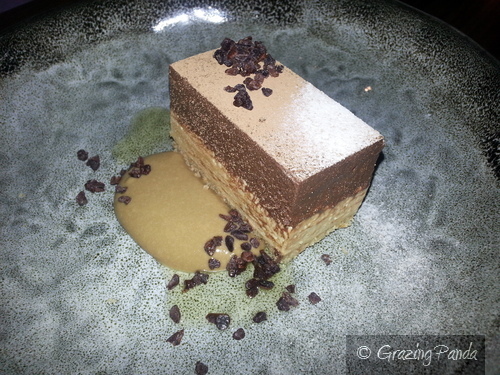 A ordered the Double Chocolate Mousse – Noble White Reduction, Cocoa Nib Brittle which looked like a tiramisu. It had layers of chocolate mousse (both white and dark chocolate) together with cocoa nib brittle which added the bitter flavouring, as well as the sweetness of the coffee cream and the Noble White Reduction. A dessert calling to all the chocolate lovers out there. 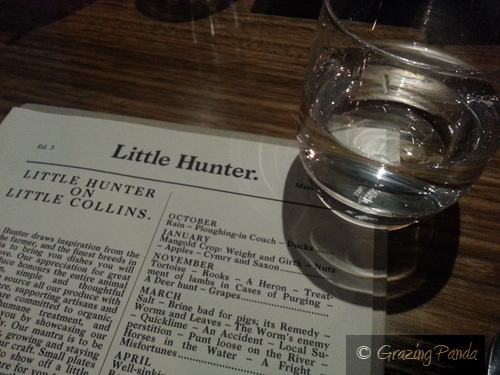 Overall Little Hunter is a great new addition the Melbourne food scene. The menu is ever evolving and the only downside would be is that the menu is limited for the vegetarians (there are only some starters and sides to choose from). For the meat and steak lovers you should definitely check this place out. Little Hunter is great for business lunches or any after work dinner or for a special occasion. I cannot wait to see what items will appear on their winter menu. Atmosphere / Ambience: Cosy, Classy and Comfortable. There are private booths which are nice for an intimate dinner.